February 5, 2019— Albany, GA—The Commodore Conyers College and Career Academy (4C Academy) together with Procter & Gamble (P&G) and Albany Technical College (ATC) are pleased to announce the names of Industrial Operations Technician (IOT) program students selected for P&G’s IOT internship initiative. The IOT program is a product of the business needs of Albany area manufacturers. P&G and other local employers partnered with ATC to develop a curriculum that prepares students for entry-level positions in and around Albany. 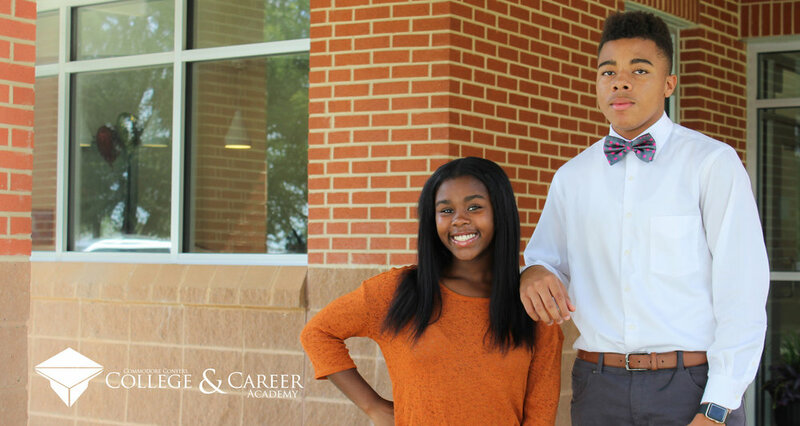 The 4C Academy recruited high school juniors to the program where they take ATC dual enrollment classes including Management, Employablility, Industrial Operations and Industrial Mechanics. As part of the IOT program, students also attain a Lean Six Sigma Green Belt Certification. Students enrolled in the program are given the opportunity to apply to P&G’s IOT internship program, which is a first of its kind partnership between P&G and public education. Students selected for the spring internship attended a welcoming ceremony at the 4C Academy last Thursday. The interns selected were Mikiera Banks, Monica Roberts, Aniya Sumlin, Amari Sumlin, and Isaiah Willams all from Dougherty Comprehensive High School, and Edwin Laster from Monroe Comprehensive High School. The internship will begin mid-March for a 6-week period. Students who successfully complete the IOT program and P&G internship will be given priority in P&G’s hiring process. 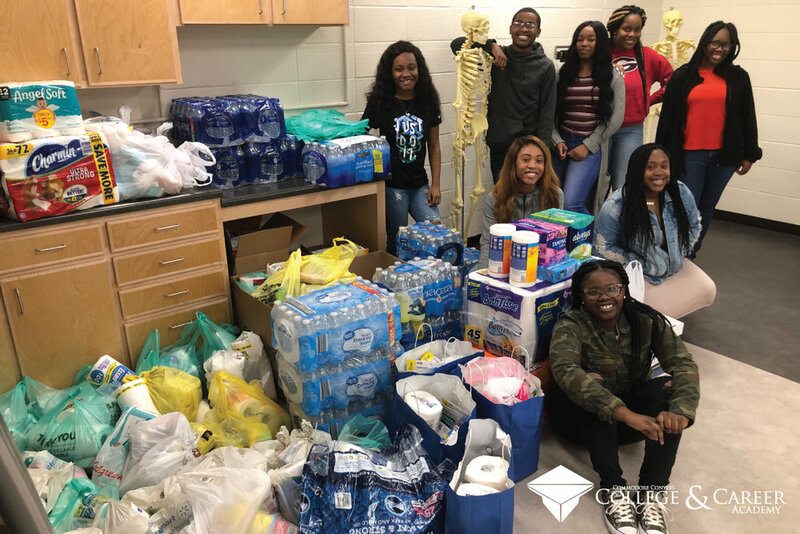 December 6, 2018— Albany, GA—The Commodore Conyers College and Career Academy (4C Academy) is hosting a community food drive in an effort to assist families in need this holiday season. A school-wide initiative, Gather-Upwas developed as a community service project by the school’s Junior Board of Directors as an initiative within the school’s professional and soft skills program. The purpose of Gather-Up is to provide students an opportunity to give back to the community. 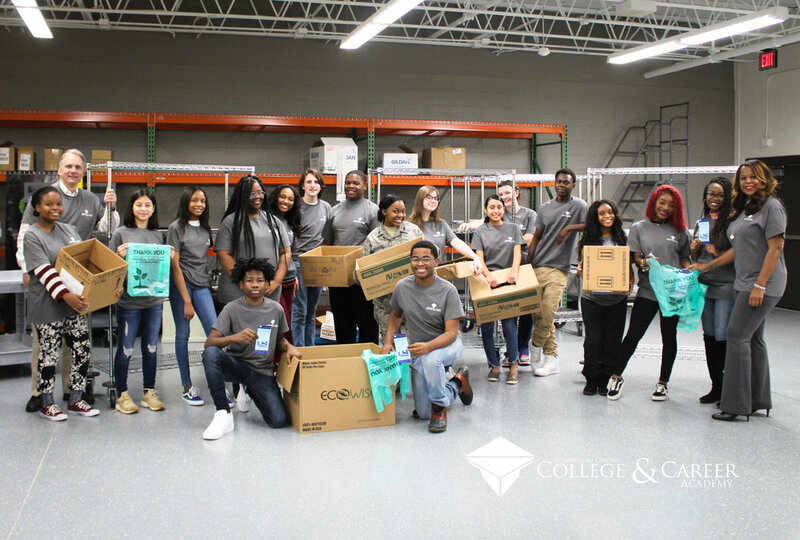 “We wanted to find a project that would help our community and involve our entire school, and felt a can drive could really help those in need, commented Earnest Christian, 4C Academy Junior Board of Directors member. Each 4C Academy team member has been given a Gather-Upt-shirt to wear, as well as grocery bags with information cards to hand out to neighbors and family. Team members will ask for donations of canned goods and non-perishable food items December 8ththrough 9th. Donated items should be returned to the school Monday, December 10th. Team members will then sort and prepare donations for distribution to local food banks. Additional donations will be graciously accepted at the 4C Academy during business hours. If you or your business would like to participate, please contact Chris Hatcher. The fall edition of the 4C Academy’s e-newsletter is available! September 18, 2018— Albany, GA—The Commodore Conyers College and Career Academy (4C Academy) Healthcare Services pathway instructors, Jessica Blanchard, BSN, RN and Melissa Laslie, BSN, RN, are seeking donations of scrubs to be worn by 4C Academy healthcare students. According to Blanchard and Laslie, “We know that for our team members to be successful, they must be dressed for the part. Here at the 4C, we ask our team to “Dress for Success” once a week in either scrubs or business attire.” Last semester, the team received multiple donations, many of which came from anonymous donors. “Our program has more than doubled since last semester, which is wonderful news. To accommodate our growing numbers, we are once again asking the community for donations of gentle loved scrubs,” says Blanchard. The donated scrubs will be assigned to students in the Healthcare Services pathway. Additional donations are needed and may be dropped off at the school during regular school hours. August 29, 2018— Albany, GA—The Commodore Conyers College and Career Academy (4C Academy) Teaching as a Profession Pathway, under the guidance of 4C Instructor, Dr. Keyla Johnson, has organized the Future Educators Book Club in an effort to help make real world connections to class standards. Dr. Johnson and the 4C Team Members are seeking the assistance of the Albany community to purchase a class set of various titles of books to be used during the 2018/2019 school year. “We are seeking monetary donations as well as donations of gently used books. The first two books for class reading are The First Days of School by Harry Wong and Rosemary Wong and Fires in the Bathroom written by Kathleen Cushman. These books serve as guides for teachers at every level, sharing ideas on classroom management and designing lessons for academic success. The class will hold weekly meetings on Fridays,” according to Dr. Johnson. The goal for the Future Educators Book Club is to raise $950. The students have already raised raised $350 towards their goal. Event participants will include Dr. Roger Tutterow, Sr. Economist, Kennesaw State University; Ronnie Lee, President, McCleskey Cotton; Maurice York, Brewery Vice President, MillerCoors; Dr. Robert S. Owor, Professor Computer Science and Software Engineering, Albany State University; Alan Amling, Vice President, UPS Ventures; Philip Hardin, CEO, YouScience; and Casey Cagle, Lt. Governor, State of Georgia. One of a network of over 40 College and Career Academies across the state, the 4C Academy was chosen to host the event in part because of the school’s exceptional relationship with the community and local industry. “We as a region understand how important advancing workforce development is for our local economy and this is demonstrated by our strong partnerships. Our business, education and community leaders have come together to invest in this effort to prepare our young folks for the jobs of today and tomorrow. This is all about bringing new jobs and industries to Georgia and to our region of the state.” Mr. Hatcher continued. The 4C Academy will also host an afterhours reception at Pretoria Fields Collective on Monday from 5:30 to 7:30 p.m. “This is an opportunity for community members to meet our event speakers including our guest speaker, Lt. Gov. Casey Cagle. Tickets are $30 per individual and may be purchased by emailing Kerry.Joiner@4CAcademy.org. School begins Thursday, August 2nd! May 04, 2018-- Albany, GA-- Students in the Audio Video Technology and Film pathway at 4C academy, led by Ms. Stephanie Burke, boarded a bus and toured some of Albany’s beautiful broadcasting facilities (WALB, WFXL, Cumulus). The first stop on their trip was Albany’s very own WALB, where they were met by First Alert Meteorologist, Chris Zelman. Students were excited, being that it was their first time in a real-life news station. When they entered the studio, Marketing Director, Mike Leach, was putting together a promo video to introduce Tesia Reed, Karla Heath-Sands replacement on WALB’s “Today in Georgia.” Leach briefly taught terms such as three-point lighting, which includes the terms key light, back light, and fill light. They even got a behind the scenes look at WALB’s control room where they broadcast shows such as, The Ellen Degeneres Show, New Girl, and even The Voice. The students also learned the importance of being factual, resourceful, and punctual. Next, they made their way to WFXL where they were guided by News Manager, Kerri Copello. Copello shared stories of her seven years working at the station, including some rules and regulations, dress code violations, and what to expect. The students were then introduced to Multimedia Journalists, Danielle Ledbetter and Mary Green, who spoke to them about their daily work efforts and experiences in the field. They even allowed the students to hop in front of the green screen and get a first-hand look into the life of a weather forecaster. This was definitely an unforgettable experience! Taking a break from the news theme, scholars visited Cumulus, a local radio station, where they got an inside look at life inside the studio. 4C’s very own, Stephanie Burke, who you may know as ~God’s Princess~ on V101.7 FM acted as a tour guide as students explored the building. The first room on the list was the sales floor. Here, Katy Edwards, Executive Assistant/Promotions Director, described her occupational duties. 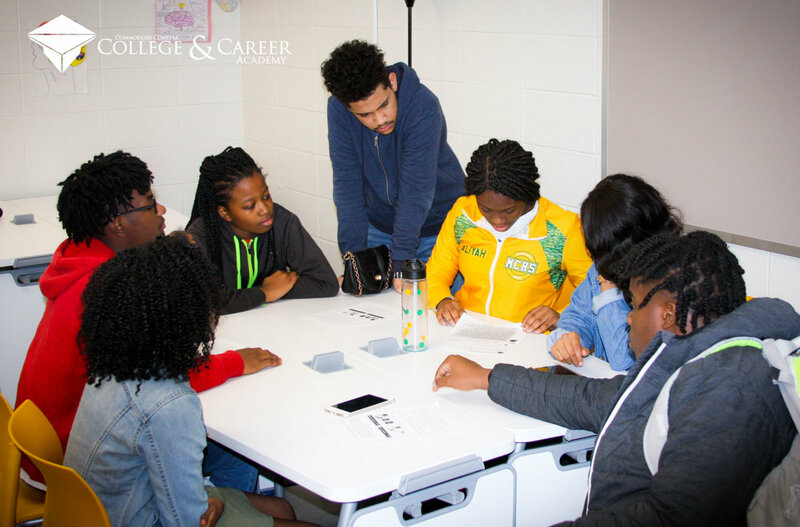 She also explained the company’s motto, “HABU.” Employees are expected to align their work ethics with the acronym, which stands for the “Highest And Best Use of…” Students were encouraged to get the highest and best use of anything they do. Next, they made their way upstairs to see where the magic happens! They were introduced to the studio in which many on air personalities, including Burke herself, record and edit commercials. While walking through the halls of Cumulus, students had the opportunity of meeting the program directors of both WJAD-FM and WKAK-FM. The students left the station with new knowledge of the ends and outs of radio broadcasting. The group ended their adventure at The Rocket, not before getting group pictures at each location. What a delicious way to end such an eventful outing! This has been The WEY at 4C Academy, signing out! – Written by: Wesley Williams, Elizabeth Jones & Yaz’myne Moye. 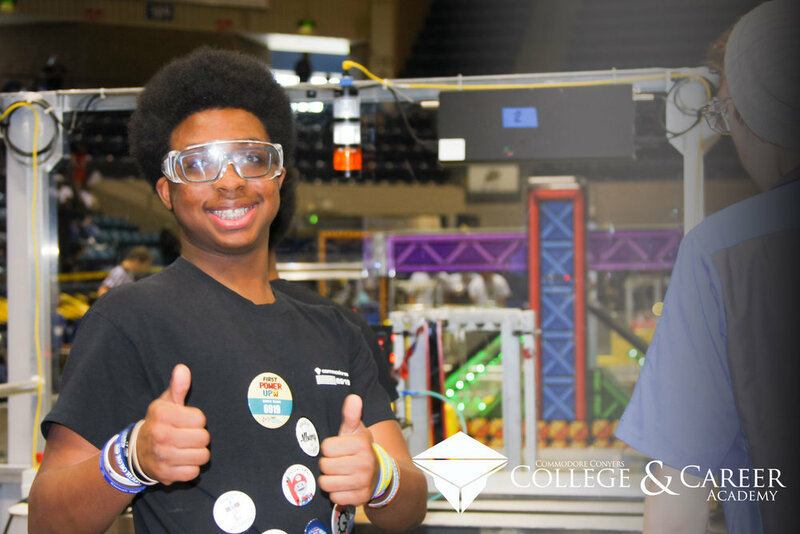 APRIL 9, 2018— Albany, GA— The Commodore Conyers College and Career Academy (4C Academy) Robotics team, the Commodores, will represent the 4C Academy at the FIRST Robotics (FRC) Championship in Houston, Texas April 18th through April 21st. In preparation for the trip to Houston, the Commodores will conduct several fundraising efforts and are offering sponsorship opportunities. Additional information is available through the 4C Academy. MARCH 14, 2018— Albany, GA— The 4C Academy Robotics team, the Commodores, is making final preparations for the Procter & Gamble FIRST Robotics district qualifying event to be held at the Albany Civic Center this weekend, March 16 and 17. This will be the second event for the 4C Academy team after an impressive showing at the Peachtree district qualifying event that was held in Gainesville, GA on March 3. According to the team’s Co-coach and 4C Academy IT instructor, Darren Hagler, “The Commodores scored 32 district points during the match in Gainesville, Ga over the weekend, which places us approximately 15th in the state. This is a spectacular placing for a rookie team in their first event.” This score also earned The Commodores the Highest Rookie Seed award and positions the team competitively going into the second district qualifying event. “If we perform at the Procter & Gamble event like we did in Gainesville, we are very likely to qualify for the State Championship being held April 6th,” Hagler explains. Each robotics team must compete in two district qualifying competitions; scores are combined to determine the top teams that will compete at the State level, then move on to the World Championship in Houston, Texas. This weekend’s event will be r will be held at the Albany Civic Center March 16th and 17th and is open to the public. 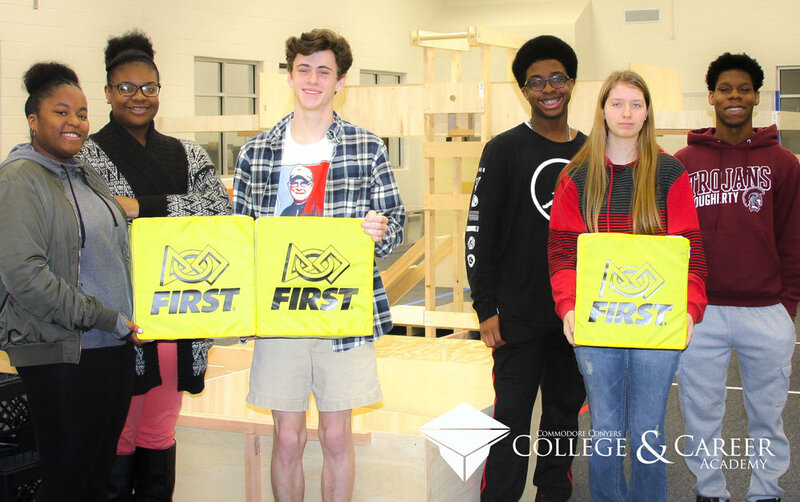 February 15, 2018— Albany, GA—With only a few weeks until the first GeorgiaFIRST Robotics competition of the season, the Commodore Conyers College and Career Academy (4C Academy) will host a regional practice scrimmage this Saturday, February 17, 2018. According to GeorgiaFIRST Robotics, “Teams from all over Georgia are invited to test their robots on FIRSTRobotics competition fields, provide and receive technical training in conjunction with other teams, and network with other students and coaches in the FIRST community.” The 4C Academy represents one of four practice locations that offer contestants a full-size field with all field elements, and inspection officials on-site. The other three sites are located in Atlanta, Marietta and Columbus. One of five GeorgiaFIRST Robotics district competitions will be held at the Albany Civic Center on March 15, 2018. Each robotics team must compete in two district qualifying competitions; scores are combined to determine the top teams that will compete at the State level, then move on to the World competition in Houston, Texas. The district qualifying events are open to the public with more information available at www.georgiafirst.org. February 13, 2018— Albany, GA—The Commodore Conyers College and Career Academy (4C Academy) Healthcare Services pathway instructors, Jessica Blanchard, BSN, RN and Jeanifer Hill, BSN, RN, received multiple donations of scrubs to be worn by 4C Academy nursing students. According to Blanchard and Hill, “We know that for our team members to be successful, they must be dressed for the part. Here at the 4C, we ask our team to “Dress for Success” once a week in either scrubs or business attire.” To assist team members unable to secure proper healthcare attire, both instructors reached out via their personal social media to ask for donations of gently used scrubs. “We are very appreciative of the donations received, many of which came from anonymous donors,” says Blanchard. February 6, 2018— Albany, GA—The 4C Academy announces the launch of Group-Up, a collaboration and problem-solving initiative developed under the school’s Sharpen-Up professional and soft skills program. Designed to promote problem solving and collaboration, the Group-Up initiative is an 8-week project in which student teams are charged with developing a solution to a real world “opportunity” impacting our region of the state. Successful teams will utilize their research, critical thinking and presentation skills in this group activity. An external review committee will evaluate the presentations and the winning solution will be presented to community leadership. According to 4C Academy CEO, Chris Hatcher, “Our goal with this project is two-fold. First, this activity will teach our team members the professional skills they need to thrive in the working world such as collaboration, team-work and critical thinking. Second, by challenging our students with a real-world scenario impacting our community, we can engage them at an early age while providing local leaders with different ideas that may have yet to be considered. The Sharpen-Up Professional and Soft Skills Program incorporates all of the school’s professional skills initiatives including the Shake-It-Up handshake competition, Listen-Up speaker series, and Gather-Up community service project. Each initiative aims to equip students with the different skills demanded by today’s employers. 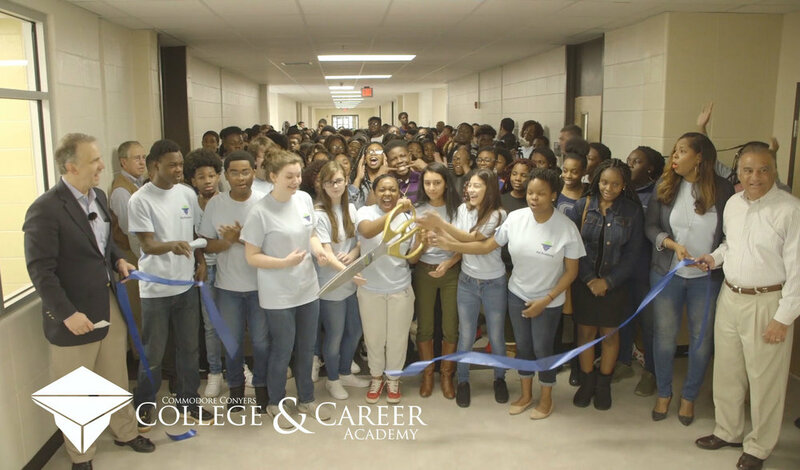 January 12, 2018— Albany, GA—Students from the 4C Academy join CEO Chris Hatcher, left, Principal Angie Gardner, right, and 4C Academy Board Chair Chandu Kuntawala in cutting the ribbon of the final phase of the school Friday afternoon. The first-of-its-kind hybrid educational facility is fully operational following a multi-million overhaul of the building that formerly housed Southside Middle School. Students at the 4C Academy spent the first half of the 2017/2018 school year utilizing only portion of the Academy’s building as the remaining labs and facilities were under construction. Beginning Tuesday, January 16th, classes will be open in the newest portion of the building, which includes a modern student center, STEM gym, logistics lab and film studio. A formal dedication with members of Commodore Conyers family and Lt. Gov. Casey Cagle is planned for the coming weeks.